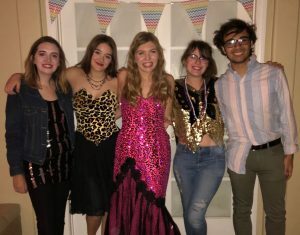 The Drama Club hosted their annual Murder Mystery party on Saturday, Nov. 10 at the home of Drama Club historian Brianna Lancaster. 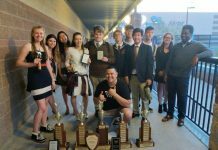 The event, planned annually with a new theme and new characters, is an opportunity for club members and thespians to increase their skills of staying in character and bond with other members. This year’s theme, 80’s prom, set the stage for an investigation to discover who was murdered and who did the killing. All participants were to remain in character all night, each being interrogated as a possible suspect or accomplice in the murder. 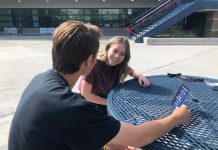 Drama Club advisors plan each year’s murder mystery party weeks in advance, taking time to create their story, assign characters, specify a time and location, and plan the schedule for the evening’s events. Following planning, drama club cabinet members announce the party and price of admission during their weekly club meeting. 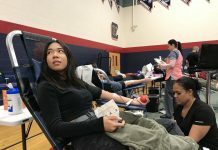 This year’s party, with more than 20 participants, raised over $200 for the club fund.